When it comes to car seats I am always on the look out for the the safest one for my son. When I came across the Safety 1st Complete Air with Air Protect I was amazed with the safety features and the new technology. 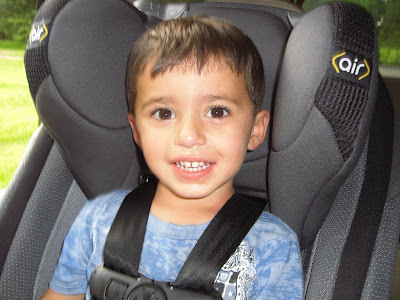 I was thrilled to have the chance to review this awesome very new to the market car seat ! When it arrived one of the first things I noticed was the great design and it looked very comfortable for my son. It must be very comfortable because my son sat in it as soon as I took it out the box until we put it in the car. One of the features he likes is the cup holder, every time we are in the car he thinks it is a must to have a cup in it ! It is nice that a cup can be in his reach and I do not have to reach over to hand it to him or worse pull over to find it on the floor. How does Air Protect™ work? Through the precise release of air, Air Protect™ compresses and shields children from side impact intrusion and immediately reduces crash forces at the most critical spot: around a child’s head. Air Protect™ does this by extending ride-down, the amount of time it takes to slow a child’s movement in a crash. With the Safety 1st Complete Air with Air Protect, your child can sit in it from 5 - 50 pounds. 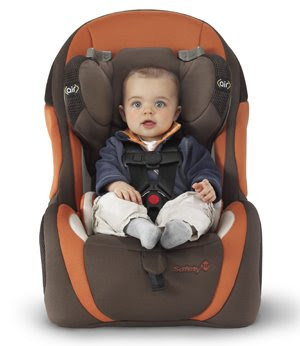 In the Safety First Air Protect, your child can sit rearfacing from 5 (newborn) to 40 pounds. (19" - 40" in height). For forward facing, the maximum limit is 50 pounds and 45". Installation is EASY, especially if your car has the Latch System. You can install the car seat with a Latch Belt, Lap/Shoulder Belt or Lap Belt. Complete Air™ is the first car seat to provide unparalleled protection against the biggest threat to children on the road today - side impact crashes. Through the precise release of air, Air Protect™ shields children from side impact intrusion and immediately reduces crash forces where the child is most vulnerable – the head. A superior testing method combined with a strict focus on head containment make Air Protect™ not only a state-of-the-art technology, but a revolution in child safety. In addition to providing superior side impact protection, the Complete Air™ Convertible Car Seat has a secure harness system to ensure the child remains in the car seat. It is also easy to install and proper installation is key to safety. According to Safe Kids, when correctly installed and used, car seats reduce the risk of death by as much as 71 percent for infants. However, as many as four out of five car seats are installed or used incorrectly. Why is Air Protect™ different? Air Protect™ Technology has been designed to defend against the biggest threat to children on the road today - side impact collisions. Side impact is by far the deadliest type of collision for children, accounting for 1 in 3 child fatalities; nearly all of which are caused by head trauma. The placement of Air Protect™ Technology on the car seat diverts crash forces away from a child’s head, the most vulnerable place in a side impact crash. The Complete Air™ Convertible Car Seat is tested with an intruding door technique, which best replicates an actual side impact crash. Dorel Juvenile Group (DJG) collaborated with Kettering University’s renowned Crash Safety Center to develop a new standard for side impact testing. This new testing method is so significant that DJG and Kettering University have shared their findings with the National Highway Traffic Safety Administration (NHTSA), supporting NHTSA’s efforts to provide more comprehensive regulations for side impact crash testing. To best understand the importance of Dorel Juvenile Group’s patent pending Air Protect™ Side Impact Technology, it is critical to understand just how dangerous side impact collisions are. Over the past 20 years, the number of deaths related to front impact crashes has declined, while side impact crash fatalities have increased by 20 percent. In a side impact crash, there is an average of just eight inches of steel protecting children in the back seat. Side impact collisions are today among the deadliest type of collision for children, accounting for 1 in 3 child crash fatalities, nearly all of which are caused by head trauma. Research from the Children’s Hospital of Philadelphia (CHOP) reports that in auto crashes involving children, 1 out of 4 crashes is a side impact crash. They are the deadliest type of collision for children, accounting for 1 in 3 child fatalities. According to the National Highway Traffic Safety Administration (NHTSA), in a crash, a child’s head is the body part most vulnerable to serious and fatal injuries, accounting for nearly all of all injuries sustained. Between 1981 and 2001, frontal impact fatalities for all occupants dropped from 61 percent to 43 percent due to significant improvements in frontal crash protection according to the Insurance Institute for Highway Safety (IIHS). IIHS also reports that during the same 20 year span, the percentage of side impact fatalities rose from 31 percent to 51 percent due mainly to the increase of travel speeds and the amount of SUVs on the road. Automobile side airbags that protect the head, chest and abdomen reduce driver deaths by an estimated 37 percent, according to IIHS. The Safety 1st Complete Air is available in McKenna (Black/Grey) or Harvest (Brown/Orange). The MSRP is $249.99. Air Protect™ Side Impact Technology will be introduced in the new Safety 1st Complete Air™ car seat, which will be available for pre-order in Babies“R”Us stores and online at Babiesrus.com beginning July 1, 2009. In August, Toys“R”Us and Babies“R”Us stores nationwide in the US and Canada and online will be the first to offer the Complete Air™ car seat with Air Protect™, followed by other retailers later in the year. For more information about Air Protect™ Side Impact Technology, please visit: www.safety1st.com/airprotect. I saw this seat in Babies R Us last week, I LOVE the new technology!!! I can't wait until this seat is available in Canada. I looks totally cool, and I LOVE the color options! You have stated an incorrect rear facing weight limit. The complete air rear faces to 40lbs(not 45). Other than that, I really enjoyed reading your review. @Anonymous, Sorry about the typo...fixed now ! Cool seat! Wish they had this when my girls were that small. I'm curious if this technology is in use in my Graco that I just bought? I don't see anything on the box. Having a special sheet for your kid may be an option for you in a few cities it is a law for you to have it in a few cities of the USA. And it's always advisable to carry one even if the law is not so cause you are not supposed to be forced to carry one if you love your kid you will. In fact there are a few car makers who have got special sheet for the kids in there car.